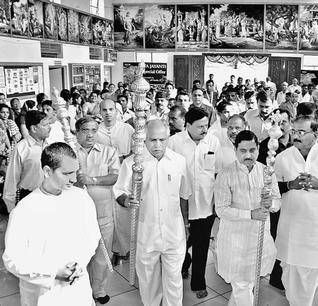 HUBLI: The International Society of Krishna Consciousness (Iskcon) will build a main temple and grand cultural complex at the existing temple premises at Raypur located between Hubli and Dharwad, which will be a unique blend of Hoysala architecture and modern architecture. According to Iskcon Hubli-Dharwad unit president Rajiv Lochan Dasa, the grand cultural complex will showcase the country's glorious tradition of art, architecture and heritage. The temple and the cultural complex, which will be beautiful synthesis of traditional South Indian temple architecture and modern facilities and its base, has been designed after the famous “Chennakeshava Temple” at Belur in Hassan district. The main ‘Shikara' is designed after the famous Galganatha Temple at Pattadakallu. The well-preserved northern superstructure (rekha-nagara shikhara), topped by amalaka and kalasha, is the striking feature of the Galaganatha temple. It will have intricately carved pillars, ornately sculpted figures exhibiting various themes from puranas, ornamental arches, and traditional gold “kalashas” crowning the temple. The temple will have one swagata-gopura (welcome tower, representing the Lord's feet), one raja-gopura (grand tower, representing the Lord's navel) and one vimana-gopura (tower above the deities' chamber, representing the Lord's head). The complex will have a prayer and meditation hall and a traditional kalyani for float festivals. 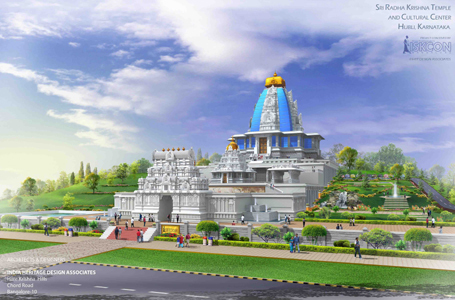 The master project will be called “Glory of India and Pride of Karnataka” and has been designed by a team of architects led by Madhupandita Dasa, President, Iskcon Bangalore, who has designed the famous Iskcon Bangalore temple. The project will have 2.5 lakh sq. ft. of built up area. As per the project, the cultural complex will be surrounded by a lush green landscape and will have a state of the art multimedia theatre and will showcase the values of Vedic culture through films, sound and light shows, video and audio animatronics. The complex will house a heritage auditorium and open air theatre which will be used for nurturing talents through heritage and cultural festivals. In addition to it, the cultural complex will have cultural and spiritual theme park for showcasing the glorious heritage through entertainment. According to Mr. Dasa, Chief Minister B.S. Yeddyuappa has consented to perform the ‘bhoomi puja' for the “Sri Radha Krishna Temple and Cultural Complex” on February 13.